Housing prices in San Francisco have gotten so bad that even people in New York are all, "Damn! You pay how much?!" And even though we like having something New Yorkers will finally admit we beat them at, we'd prefer it wasn't rent price. 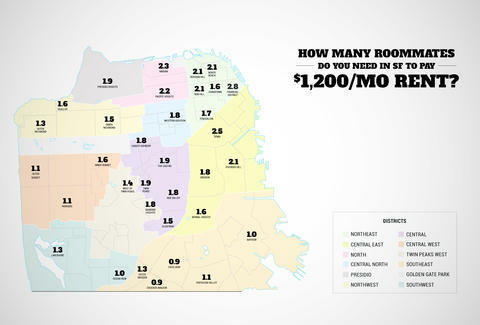 In the interest of helping out anyone looking for a place, we asked the nice folks over at PadMapper -- a site dedicated to finding you apartments by scrubbing through countless postings and collecting them in a single, easy-to-use place -- to find out how many roommates you'd need to have to pay $1,200/month in various SF neighborhoods. Joe Starkey is Thrillist's San Francisco Editor, and currently has four roommates that he, thank God, gets along with great. Follow him on Twitter.